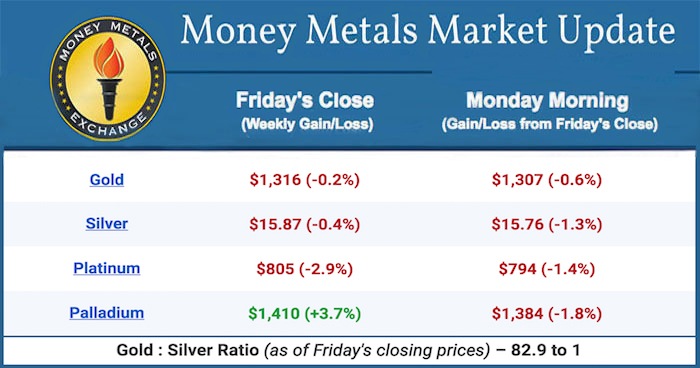 February 11, 2019 — Precious metals prices lost some ground in last week’s trading and continue to fall this morning. The U.S. dollar has rallied sharply, putting pressure on gold and silver prices. The monetary metals look to be in a relatively strong position technically, however. Prices have consolidated the December and January gains, demonstrating resilience in spite of the rally in the dollar and in stock prices. We’ll see if better looking price charts are enough to lure some speculative interest. Much of the focus this week will be back on Washington DC. Lawmakers and the president have until 12.01 AM Saturday to agree on spending deal in order to avoid a second federal shutdown. At the moment, President Trump and House Democrats do not appear close to a compromise. Federal agencies are still catching up on planned economic data releases, after delays prompted by the first shutdown. This week investors will get a look at December retail sales, about a month later than originally scheduled. Savvy, self-reliant investors are embracing Money Metals Exchange as their trustworthy resource for gold and silver bullion.